Perfect for students and home schooling! This is a great step-up from our Model O intermediate-level system. Perfect for the science buff or high-school level student. It has 1000X capability, a fine focus, an Abbe style illumination system, and a mechanical stage. This system has more features than what your student would find in most high-schools. And if you want to get your elementary/middle-school student a microscope that you can be assured will last them through high-school, this is it. Don't bother comparing it to other microscopes at this price, go ahead and compare it to much more expensive systems! It includes a pointer in the eye-piece, which allows your student to point it at something he/she finds interesting and then show it to you or others! It's got a 110 mm by 120 mm stage, so those larger specimens will fit on it, a UL approved power cord for safety, and comes with a 1-year warranty. It includes a vinyl dust cover and instruction manual. ALSO RECOMMENDED, is the OPTIONAL ACCESSORY STARTER KIT (click here for details) so your student can get going on a variety of projects as soon as it arrives! In addition, to transport the microscope, we would recommend our Microscope Carrying Case made of nylon with heavy duty straps and zip-down side. Separate inner liner provides support. Easy fitting straps inside adjust to secure microscope. Size= 12" x 8" x 18"
Get the Model P-01400, the Accessory Kit and Free Ground shipping to anywhere in the continental U.S. Just choose the BUNDLE SPECIAL on the top left. 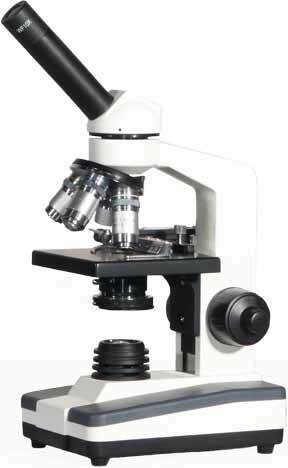 Here's a list of the many features included with this advanced-level student microscope package.